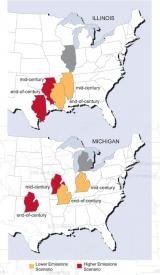 ﻿ Fun Easy English - Environment - Global warming - Climate change Impacts in the Midwest. 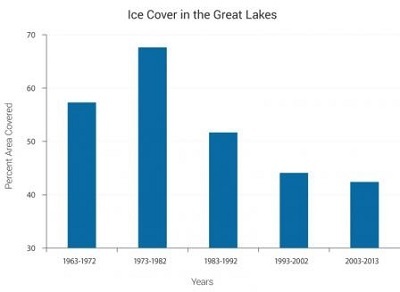 The Midwest has gotten warmer, with average annual temperatures increasing over the last several decades. Between 1900 and 2010, the average air temperature increased by more than 1.5°F. The rate of increase in temperature has accelerated in recent decades, particularly nighttime and winter temperatures. 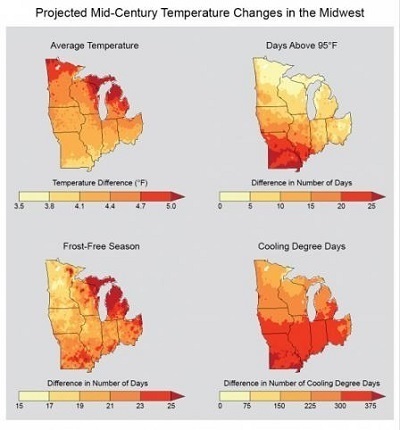 Temperatures are projected to continue increasing across the Midwest, with the greatest increases in average temperature expected in northern areas. Southern states will also experience more hot days, with a greater number of days over 95°F and fewer days below 65°F, which could lead to greater energy demand for air conditioning. The Great Lakes border many Midwestern states and are important for drinking water, transportation, commerce, and recreation. Together, these lakes contain 84% of North America's surface freshwater, and provide drinking water to more than 40 million people.